At Madison Square Garden in New York on Wednesday afternoon, Canelo Alvarez (50-1-2, 34 KOs) and Golden Boy Promotions announced an 11-fight deal with global sports streaming leader DAZN. As part of the partnership, Golden Boy Promotions will put on up to 10 high-caliber fight nights per year that will stream live on DAZN beginning in early 2019. The new era will begin Saturday, Dec. 15 when Alvarez challenges Rocky Fielding (27-1, 15 KOs) for his WBA Super Middleweight World Title. This groundbreaking deal is the richest athlete contract in sports history. 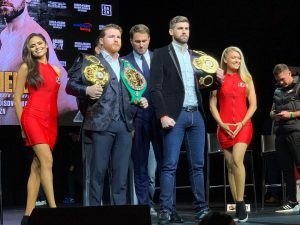 In a press conference, the fighters and key executives took the stage to discuss the record-breaking deal as well as the upcoming fight at Madison Square Garden – Alvarez’s first in the iconic venue.